Often, when creating new vegan or vegetarian meals, I would take my inspiration from non-vegetarian/vegan recipes that I enjoyed when I was younger. 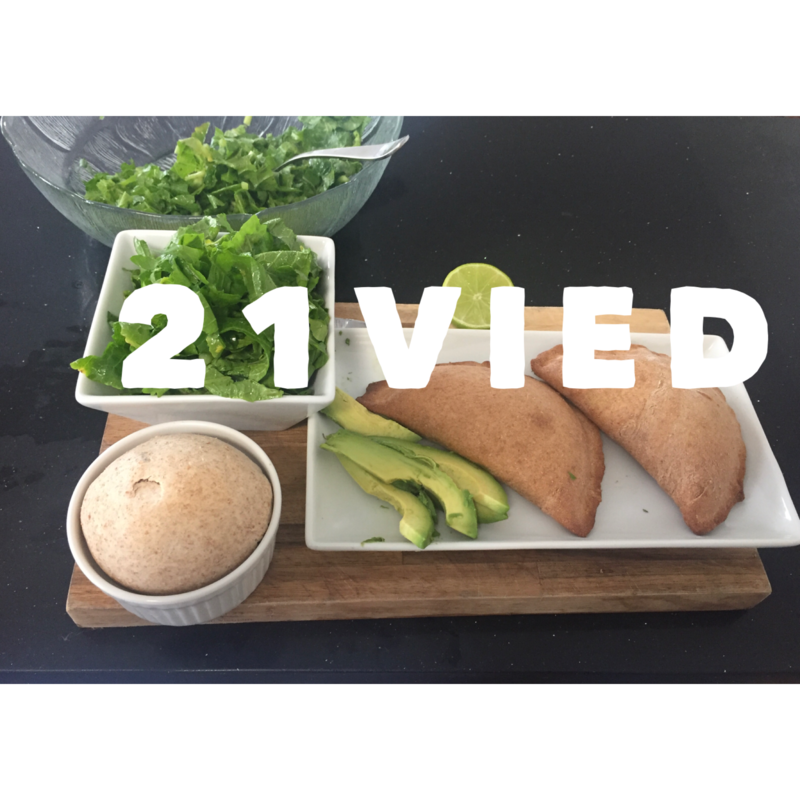 This simple, healthy and vegan Caribbean appetizer, is a favorite of mine because of the delicious combination of warm dough and tenderized sautéed vegetables. Purple cabbage is widely reported as a healthy dietary option because it balances blood cholesterol, improves immune system productivity and reduces inflammation. Additionally, it is hard to deny a warm, freshly baked, serving of raisin bread. In one bowl, pour 2 cups of flour (place this bowl on the side). In another bowl pour the remaining 2 cups of flour. Add the raisins to bowl number 2. Pour 1 pack of instant rise Yeast into ¼ cup of hot water, then, add 2 teaspoonful of the Pink Salt, 4 tablespoonful of Honey, 3 tablespoonful of Coconut Oil and 1 cup of Almond Milk to the hot water. Warm the baking pan. Add ½ tablespoonful of Olive Oil. Wash and chop the cabbage into 5cm pieces. Place the cabbage in an appropriately sized bowl. Shred the carrots into thin pieces. Chop the sweet onion into thin 1cm slices. Chop the green onions into 5cm pieces. Chop the garlic into 3cm size pieces. Add the herbs to the bowl with the cabbage. Add one teaspoonful of Pink Salt. Warm a skillet or frying pan on MEDIUM heat for approximately one minute. Pour 1 tablespoonful of Olive Oil into the pan. Allow enough time to heat the oil. Add the contents of the bowl into the pan. Sauté for approximately 15 minutes. Place in refrigerator for approximately 45 minutes to allow time to cool. Divide the dough set aside from earlier in half. Using a roller pin, flatten the dough to a thickness of approximately 2 cm. Shape in the style of an open book. Add the purple cabbage to one side of the dough. Secure the cabbage inside by sealing the ends of the flattened dough. Repeat. Warm the cookie sheet. Add 1 tablespoonful of Coconut Oil. Carefully add the patties to the cookie sheet. Wash, dry and chop the Iceberg Lettuce into 3 cm thick pieces. Add the avocado to the lettuce. Add 1 tablespoonful of Olive Oil to the salad. Next PostShould you toss-out your MICROWAVE oven?